Test scores for English learners, who make up 12.5 percent of Seattle Public Schools students, are worse than they were four years ago. 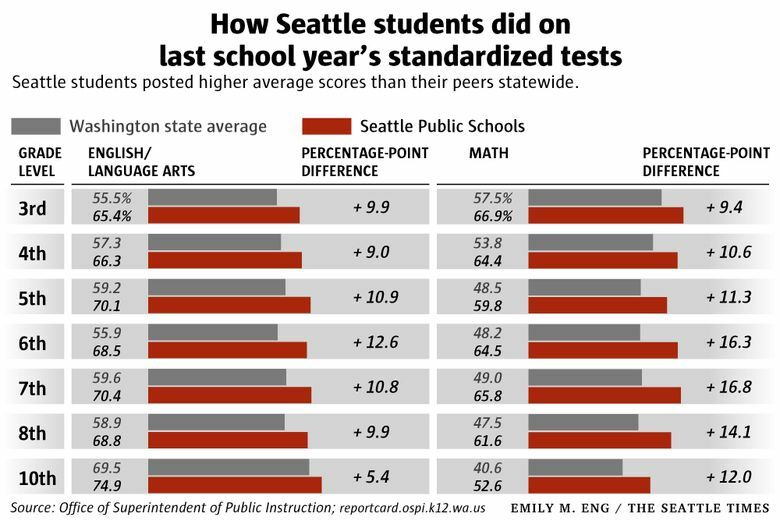 Seattle Public Schools’ students have posted better test scores than the statewide average since at least the 2014-2015 school year, according to a year-over-year analysis released by the district late last week. In the 2017-2018 school year alone, Seattle’s middle-school students outperformed the state by more than 10 percentage points in English, and around 15 percentage points in math. Almost every group of students in Seattle has netted overall gains in the last four years — except for students learning English, whose scores were higher during the 2014-2015 school year than they were in 2017-2018. The overall picture is positive — though sometimes only slightly — even among students who are typically under-served by public schools, such as students with disabilities and students of color. Since the 2014-2015 school year, passing rates for black students in grades 3 through 8 have increased by 2.4 and 3.7 percent points in math and English exams, respectively. Students receiving special-education services performed 5.5 percentage points better on English exams than they did four years ago. It’s important to keep in mind, though, that the test doesn’t follow the same students — the scores show how one year’s worth of third-graders performed relative to those who preceded them. About 12.5 percent of Seattle’s 54,000 public-school students are English learners, slightly more than the statewide average. As a group, they speak 147 different languages. More than 2,500 of them, grades 3-10, took the English and math exams. Though the dip in English learners’ score was a small 2 percent points in English and 1.4 percent percentage points in math, the change stood out against groups like low-income students, who — despite their declining enrollment in Seattle schools — still posted small gains. “Our ELL services department is under new leadership and has been taking steps to develop a new strategic plan to improve its services and outcomes for students,” the district said in a statement. The district said it is contracting with an outside group to review its offerings. In an interview last week with The Seattle Times, state schools chief Chris Reykdal highlighted students with limited English as a group of particular concern. “I think part of the answer there is to stop forcing an English-based test on students trying to learn English,” he said. “We’re going to seek more dual-language pilots” for schools. The district will use the data, along with other outcomes like graduation rates, over the next school year to develop a strategic plan and determine which schools are in need of support, said Anderson. Individual schools may develop goals around the new results. Seattle Times staff reporter Neal Morton contributed to this story.